Update: For more info, check out my post on Gebhard Words State Park on ChicagoCamping.org. For budget-minded folks living in the Windy City, finding cheap campgrounds near Chicago can be a chore. 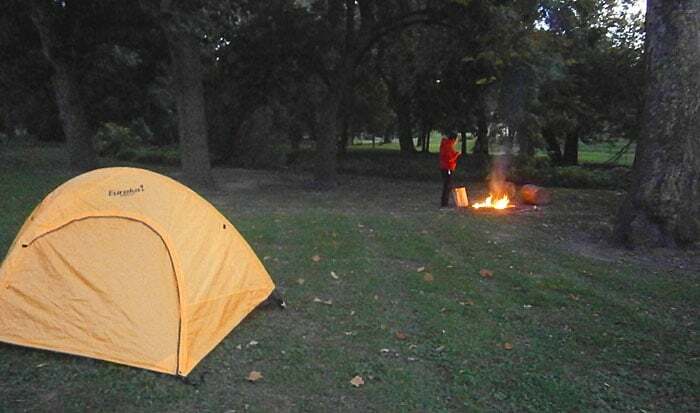 This weekend, I found one and headed to Gebhard Woods State Park, which offers nightly camping for just a few dollars. It was a mixed bag, for sure. Being able to see the stars was nice, but it wasn’t a full-on nature experience. Read on for my review. Gebhard Woods is located in the town of Morris, Illinois, which is not immediately near Chicago but is only about an hour away. The nightly rate is just $6 per tent, so it’s extremely affordable. The campground is not like most; you cannot pull directly into your site. Instead, you must hike about a half mile into a grassy designated camping area. I like that – the walk keeps away the meek and keeps the site relatively uncrowded. 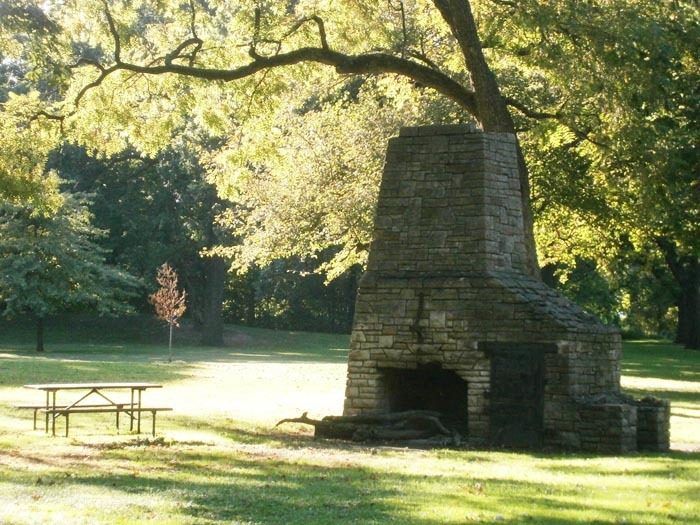 The camping area has grills, picnic tables and fire pits. The park has fishing ponds and streams throughout, as well as a hiking and biking trail. So, about that hiking trail… I love a good hike, but the problem is that this one runs right past a sewage plant. Really! We tried to hike and were overcome by the stench, and cut short the hike. There isn’t any wildlife here. We saw a groundhog or some sort of small mammal run past and became excited, because that was it for animals in the park. It certainly didn’t have the appeal of camping in Death Valley with coyotes. It rained this weekend, and our tent leaked, which isn’t the park’s fault, of course. It leaked around one of the zippers, but not too severely. So now I know to get that sealed up before heading out on any serious backcountry excursions. The worst part of the experience was the guy who went around collecting the camping fee at 8 am, rustling tents and waking everyone up in the process. Not cool at all. I guess you get what you pay for, sometimes. I’m not sure if I would be eager to return to this Illinois state park. But if the stars aligned as they did this past weekend, where I just want to get out of the city and find a cheap campground near Chicago to relax and take in a bit of nature and see the stars without busting my budget, I’d consider going back. Check out Gebhard Woods’ official website. Sorry Gebhard was a bust. I know it is a bit of a hike out here, but you missed the best of the area. Just east of where you were is an amazing nature experience. 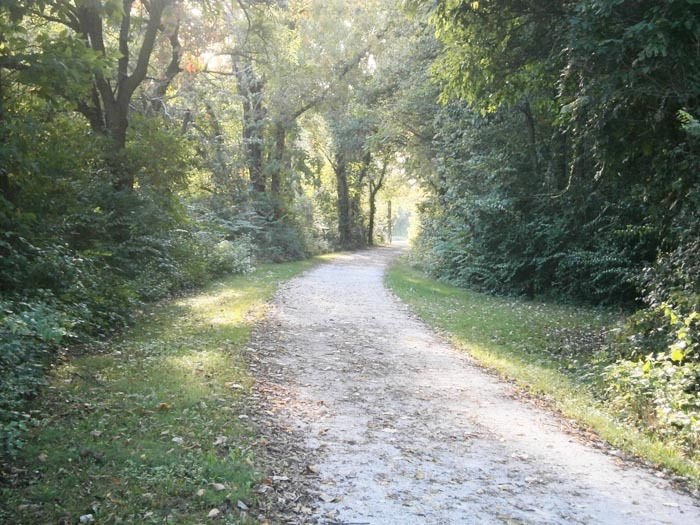 The town of Channahon ( follow 55 just past Joliet and 80) offers McKinley Woods for camping, biking, fishing, trails, and canooing. There are actually 2 parks a couple miles apart. I grew up in Cook county and after leaving the area for the military moved back 20 years later. Having been spoiled by living in beautiful places on both Atlantic and Pacific coasts I did a ton of research on what town we wanted to come back and “retire” to. Channahon is the northwestern most town in Will County right at the intersection of highways 55 & 80. There are actually 3 state parks here so check out the smaller I&M canal park too. They are all just a few miles apart and all are along the canal so if you are fit enough you can walk to them all. Please do not miss out on this amazing area. Erika, thanks for the info. I’m familiar with some of the state parks in the area and I hope to do some camping there next month. Looks good! The surroundings look quiet and peaceful… Except that wierd guy collecting the money early morning, I am an early riser, so not a problem for me!!! I know, it’s hard to sleep late while camping, that’s why the wake-up call was so annoying! It was overcast and raining on this day, so it was a rare opportunity to sleep in peacefully.